Older Americans Month got its start in 1963 as a result of a meeting between President John F. Kennedy and the National Council of Senior Citizens when May was designated as "Senior Citizens Month." At that time about 17 million Americans had reached their 65th birthday, about one-third of older Americans lived in poverty and the number of programs to address their needs were minimal. In 1980, President Jimmy Carter designated Senior Citizens Month as "Older Americans Month." Today, Older Americans Month is celebrated each May to honor and recognize older Americans for the contributions they make to our families, communities and society. The Administration for Community Living, a division of the U.S. Department of Health and Human Services, issues a theme for Older Americans Month. Jewish American Heritage Month was proclaimed by President George W. Bush on April 20, 2006. The President said, "We celebrate the rich history of the Jewish people in America and honor the great contributions they have made to our country." Congress, with the aim of helping disabled veterans, designated the first week of October as National Employ the Physically Handicapped Week in 1945. Seventeen years later, the word "physically" was removed from the phrase in order to recognize the needs and contributions of individuals with all types of disabilities. In the 1970s, a shift in disability public policy led to further emendation. For the first time, it was viewed as discriminatory to exclude or segregate people because of a disability, and activists were fighting strongly for legal revisions. As a result, the U.S. saw changes such as the passage of the Americans with Disabilities Act in 1990 and the designation, by presidential proclamation, of a full month to increase public awareness of those with disabilities and appreciate the capabilities of the 30 million people in the U.S. of working-age who are disabled. Various programs throughout the month headed by The Office of Disability Employment Policy emphasize specific employment barriers that still need to be addressed and eliminated. Every year the president of the United States signs an executive order designating the month of October as National American Heritage Month, in recognition of the many achievements and contributions made to American culture by persons of Italian heritage. 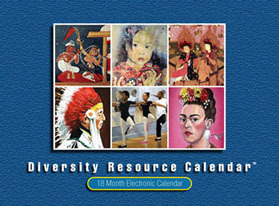 References: Electronic Diversity Resource Calendar, Diversity Resources, Inc. The 2017 electronic calendar offers 12-months of the most comprehensive information available with over 600 entries. Displaying world-class artwork, new features include oral pronunciation of holidays in various languages; videos accompanying entries -- watch a Chinese Lantern Festival, listen to songs of a Muslim EID, or observe a Native American Heritage cultural celebration. Find in-depth explanations about how multicultural holidays and events are celebrated complete with recipes of key foods, and a powerful search engine to quickly find all entries on a particular subject. Put this extraordinary resource at the fingertips of all your employees. Prices start at $99 a year for this exceptional calendar; the more users you have, the more economical the price per user. Request a Quote and Fact Sheet or call 206.362.0336. REQUEST MORE INFORMATION TODAY!